The miracle we have been waiting for is now here: Solea! 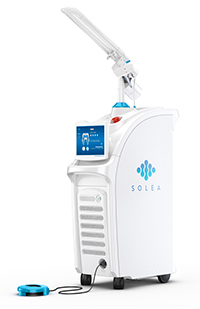 Solea is a dental laser that allows us to provide most dental procedures without anesthesia. Eliminating the injection and the “numb” feeling in your face creates a more gentle, comfortable dental experience.This makes every dental procedure faster and easier. Solea is the first CO2 dental laser system cleared by the FDA for hard- and soft-tissue procedures. It was developed in Boston, Massachusetts by Convergent Dental, based on research conducted at the University of California School of Dentistry. Solea offers a unique wavelength guided by sophisticated computers to deliver virtually painless dental procedures for both teeth and gums, from simple cavities to complex surgeries. Not only is the laser virtually painless, it is also vibrationless and noiseless. The experience is so unique that you will find it hard to believe you have been at a dental appointment. Have Questions? We’ve got answers! Send us a message and we will get back to you within 1 business day.